SUBHEAD: The County Council turns down $100,000 in private donations to fund climate action plan. 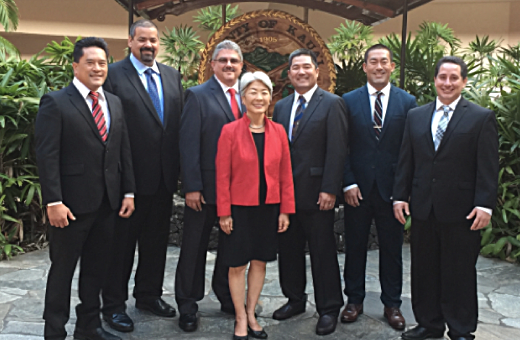 Image above: Kauai County Council members 2016-2018 - Mason Chock, Arthur Brun, Chair Mel Rapozo, JoAnn Yukimura, Ross Kagawa, Derek Kawakami and Arryl Kaneshiro. From original article. Opponents of taking the money question whether the county needs its own plan. One said the work should be left to the federal government. Kauai County Council members have rejected $100,000 in private donations to fund a climate action plan for their rural island, which is particularly susceptible to rising sea levels, stronger storms and other effects of climate change. In a 4-3 vote last week, Council Chair Mel Rapozo and members Arryl Kaneshiro, Ross Kagawa and Arthur Brun opposed a request from Mayor Bernard Carvalho’s administration to accept $50,000 from the Hawaii Community Foundation and a matching $50,000 from the nonprofit Partners for Places. They expressed skepticism about the need for a county climate plan, saying they didn’t want to duplicate the state’s efforts. They also felt the county economic development director’s explanation of the potential funding was insufficient. Councilwoman JoAnn Yukimura, who along with Councilmen Derek Kawakami and Mason Chock supported accepting the money, pointed out at the meeting that the United States is no longer leading on climate change. “Under President Trump, we’re withdrawing from it and really losing face in the world,” Yukimura said, referring to Trump’s decision to withdraw from the Paris climate accord. The Paris agreement, signed by 195 nations in 2015, established a goal of limiting the global temperature increase to 1.5 degrees Celsius above pre-industrial levels and laid out plans for countries to work together to adapt to the adverse effects of climate change. “That’s why the cities now are rising to address it and saying we’re going to do it because it’s affecting the lives of our citizens, it’s affecting the planet and I think this county needs to join in and do that,” Yukimura said. The council’s Economic Development and Intergovernmental Relations Committee took up the matter again Wednesday, but the deadline had passed Monday to use the foundation’s grant to apply for the matching funds from Partners for Places. George Costa, director of Kauai’s Office of Economic Development, said Wednesday that he had been reluctant to disclose Monday’s grant deadline at last week’s meeting because of the way council members had reacted the previous time the administration came before them with a last-minute request to apply for a Transportation Alternatives Program grant. At least one council member said the additional information provided Wednesday by the county’s energy and sustainability manager, Ben Sullivan, who was unable to attend their meeting last week, would have changed their vote. “Had we had this information last week, this would have passed,” Rapozo said. Costa said the administration tries to give the council as much notice as possible, but in this case was uncertain whether the private funding would be available until July — although the county started talking to the Hawaii Community Foundation in January. “A lot of these opportunities do come at the last minute,” Costa said. Still, Yukimura questioned during Wednesday’s meeting why the county would not want to have the council accept the foundation’s funding, since there was ample time to use it to meet the next deadline in January to apply for a matching grant from Partners for Places. Sullivan said there’s still a chance the administration will come back to the council to ask for such approval, but he noted that the foundation is now looking for a nonprofit or other third party to receive the funds. He was not sure if new recipients had been determined. “We’re kind of strategizing and rethinking,” Sullivan said. Kagawa said at last week’s meeting that the idea of a county climate action plan reminded him of Kauai’s efforts to address “all this fear” over genetically modified organisms. The county passed a bill in 2013 to require GMO companies to disclose more information about the pesticides they use and abide by setbacks for spraying. A federal court later overturned the law. Kaneshiro had his own fears over what a climate action plan might obligate the county to do. Yukimura said the plan would not obligate the county to do anything, but instead would provide data and possible strategies. Sullivan said the county’s climate action plan would add a greater level of detail to the data the state Department of Health is collecting about greenhouse gas emissions, for instance. The council members, even those supporting accepting the funding, said they did not get the information they needed from Costa last week. Even Yukimura later called his answers “weak.” But those in favor said it still made sense to accept the money and then work out the details for the plan. Kawakami, who was concerned about the message last week’s vote would send to future potential donors, said he wants a plan that produces results. Costa said $10,000 of the grant would have gone to a greenhouse gas study that looked at emission levels from various sectors, such as electricity, the landfill and transportation. He said $40,000 would have gone to community engagement, $10,000 would have been for contingencies and the rest would have been used to contract with the University of Hawaii’s Department of Urban and Regional Planning to drive the plan. Rapozo said at last week’s meeting that community engagement could be part of a county plan to address climate change, but he questioned spending the money on that, even it wasn’t from Kauai taxpayers. This was the third time the council has rejected funding a climate action plan. Last year, the Hawaii Community Foundation said it would provide $75,000 if the county chipped in $30,000, Costa said. Kagawa said last week at the meeting that he still did not trust the administration when it comes to addressing climate change. Yukimura, in an email trying to rally her constituents after the vote, called climate change the “defining issue of our lives.” She said Kauai’s fragile and unique environment in particular has a great challenge ahead that demands leadership, community involvement and consensus on a course of action. In April 2016, Sullivan tried to convey the urgency of coming up with a plan to address climate change while encouraging the council to support the mayor’s $30,000 budget request. “It’s past time for us to champion this,” he told The Garden Island newspaper at the time. “Despite some communications challenges, today’s meeting seemed to illustrate that our County Council, and quite a few people in our community are also in full support of this effort, so I am confident that we will find a way forward with this work,” he said. Darcy Yukimura, the foundation’s senior philanthropic officer on Kauai, said the island still has the opportunity to be a leader in the state. Read more about the administration’s plan below. The heck with them. The people of this island thru grass roots and organizing can take the climate change rein and make it happen. I guarantee, with big enough grass roots, the council will get on the band wagon. Getting water back into the Waimea r. r.